I have known of Ricky Lee’s Trip to Quiapo scriptwriting manual for quite some time through friends’ discussions on how it describes writing. I’d wanted a copy since. However, as it was always out of stock, it wasn’t until August 2012 that I was able to get myself a copy. Whopee! Now, as mentioned, this is a manual on scriptwriting. But then many of the points I have read applies to writing in general. Excited as I was to read it, I have only managed to read a few lines from the first chapter. Let me say that even then, it was as though I’d actually gone through an intense workshop. This is just like saying you cannot rely on just plainly asking advise on how to write from the more seasoned writers/novelists. No amount of teaching or reading instructional books will do that. You have to discover, to actually write, to live and experience living, so you can learn the ropes. Maybe you can rephrase your question next time: What experience/s did you go through in writing your manuscript/novel? There could be more lessons for you to pick up from our answers there. 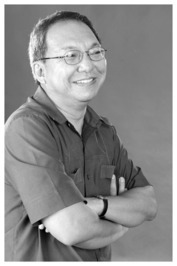 Ricardo Lee, aside from being one of the premier scriptwriters in the Philippines is also a multi-awarded fictionist, journalist, and playwright. He is also one of the 100 Centennial Awardees of the Cultural Center of the Philippines, and a Gawad-Balagtas Awardee 2000 of the Unyon ng mga Manunulat sa Pilipinas (UMPIL). So what am I saying? Find your voice. Find your style. Stop asking how you should do things. I’m not saying don’t ask for help or advise. But start on it now. Don’t be afraid to get lost. Make your own path. And do enjoy blazing your own trail.